I won’t say that cocoa butter is like chocolate for your skin… but it’s as close as you’re going to get! Like chocolate, cocoa butter is extracted from the cocoa bean. 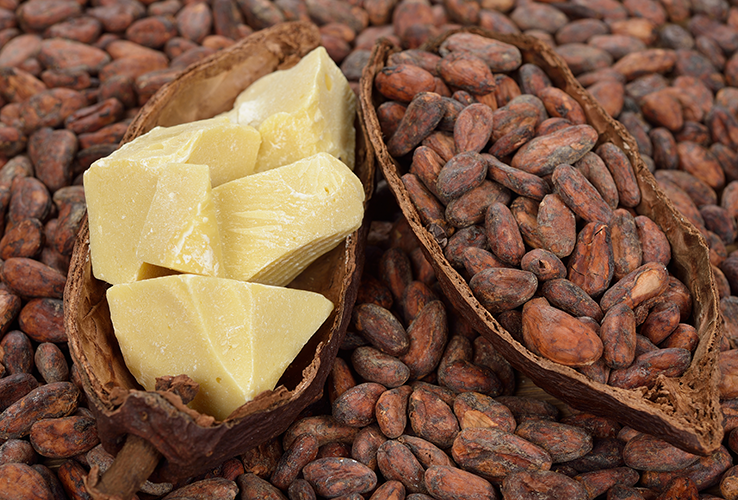 Like chocolate, cocoa butter has a rich, smooth, indulgent texture. And like chocolate, cocoa butter is filled with healthy antioxidants that promote overall wellbeing. 1. Cocoa Butter is Full of Antioxidants: Free radicals are a serious problem when it comes to aging. Cocoa butter is full of antioxidants (compounds that combat free radicals), including oleic acid, stearic acid, and palmitic acid. By neutralizing free radicals, cocoa butter’s antioxidants reduce environmental stress on the skin, leading to a healthier, younger looking complexion. 2. Cocoa Butter Fights the Signs of Aging: Cocoa butter contains polyphenols, an antioxidant compound that promotes healthy skin. The polyphenols you’ll find in cocoa butter are associated with improved skin elasticity and tone, better hydration, and better collagen retention and production. All of this leads to skin that looks and feels healthier and younger. 3. Cocoa Butter Moisturizes Thirsty Skin: You’ll find lots of saturated fats in cocoa butter. I know we’re all programmed to wince when we think about saturated fats, but they’re extremely beneficial when applied to the skin. The fats in cocoa butter are easily absorbed, helping to retain moisture and improve your skin’s health. 4. Cocoa Butter Helps Scars Fade: All of cocoa butter’s amazing properties work together to help scars slowly fade away. Your skin needs to be well hydrated to regrow skin tissue. Cocoa butter’s hydrating properties help speed this repair. This butter can also smooth out a scar’s texture, which makes it less noticeable. I’ve had customers tell me about amazing results they’ve seen from using cocoa butter on scars and stretch marks, which is one of the reasons I love using it. 5. Cocoa Butter Soothes Inflammation: Cocoa butter is a lovely, natural way to reduce skin inflammation. Use it to address eczema and psoriasis flare-ups, or to provide relief for rashes or other types of inflammation. Its inflammation fighting abilities also make cocoa butter a great choice for a natural shaving lotion. Cocoa butter is an incredibly effective way to support your skin. Its numerous benefits, enjoyable texture, and lovely aroma make it one of my favorite ingredients to work with. If you like chocolate (or even if you don’t), you’ll love what this incredible ingredient can do.